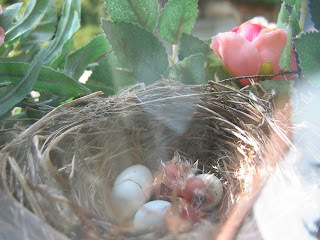 It's be awhile since I first mentioned the bird who made a home in our wreath. Well since then, there was one additional egg (5 total), Ryan identified the type of bird and we now have at least one baby. Meghan got Ryan a bird book for Christmas last year and he actually got to use it. He identified the bird has a house finch. And, based on what we have found on the web, that looks about right. Today we noticed at least one, possibly two babies have hatched. I had a really tough time taking a picture. Had to wait until the mommy was gone, plus there was a ton of glare on the door this morning. I did not want to take it from the outside because I would rather not get attacked by a mommy bird. I'll try later. Here is what I did manage to capture.